I have always liked to use a variety of fabrics to add interest. 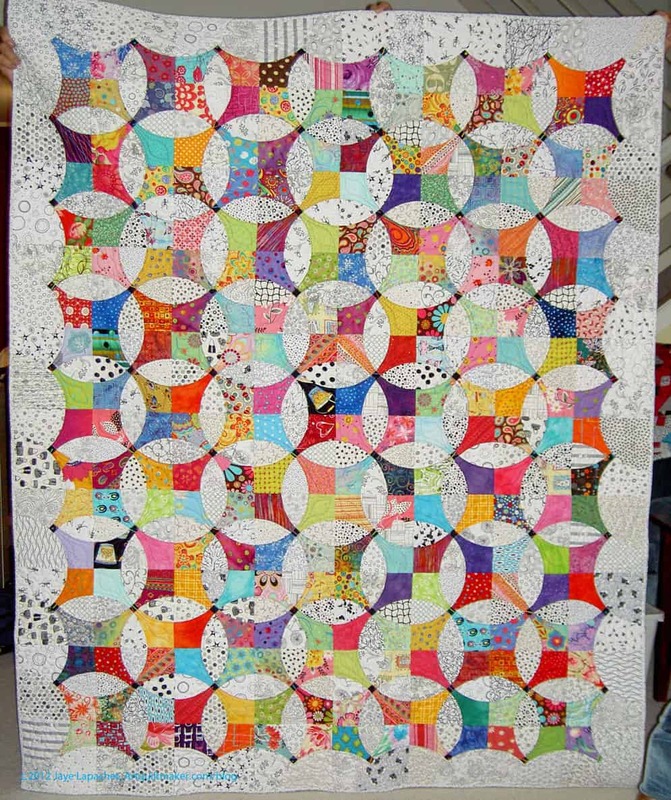 This means that I like scrap quilts, but I also like to use a variety of fabrics in the same colors in my quilts. I learned this technique from Mary Mashuta. Many of you modern quiltmakers probably think she is old time and her techniques are not a useful addition to your modern arsenal. Mary is a really good teacher. 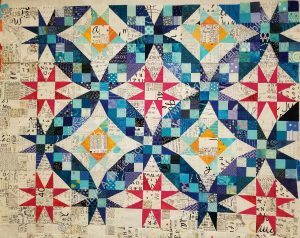 She trained as a teacher and taught at SF High Schools for years before she left to become a quilt teacher. Her ideas are easily translatable to different fabrics and styles. I took a class from her about “pushed neutrals,” which had to do with making a background from a variety of neutrals rather than just using one fabric. I extrapolated that idea out to include non-neutrals as well, which evolved into using a variety of fabrics in the same colors for backgrounds. I have since used this technique for foregrounds as well. Kay V, a longtime reader, made a comment that made me think about my low volume background for En Provence. As you know, the background is a variety of text fabrics. These are, mostly, the same fabrics I used for the Carpenter’s Wheel. Jennifer’s Quilt is a quilt I made for my acupuncturist who really helped me get back on the road to health. 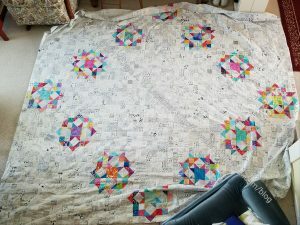 When she died, I got the quilt back. Bittersweet. I would rather have her and never see the quilt again. It is the first quilt, I think, I made using a variety of black and white fabrics for the background. Some of the pieces are a little heavy and I probably wouldn’t use them again. I also used the same technique for the foreground – the pinks, blues and limes are all a variety of fabrics in the same tones/shades. The blues have more contrast than the pinks and limes. Flowering Snowball was primarily supposed to be a handwork project – something to take around with me when I needed a to-go project. At that point, I didn’t think as much about the background. In general this is not as successful an exercise in using different fabrics for the background. Some of the prints read grey rather than white. Others have too heavy a hand in the print department. I got better with the Carpenter’s Wheel. I was focusing on using text prints and, thus, tried hard to make the background work. 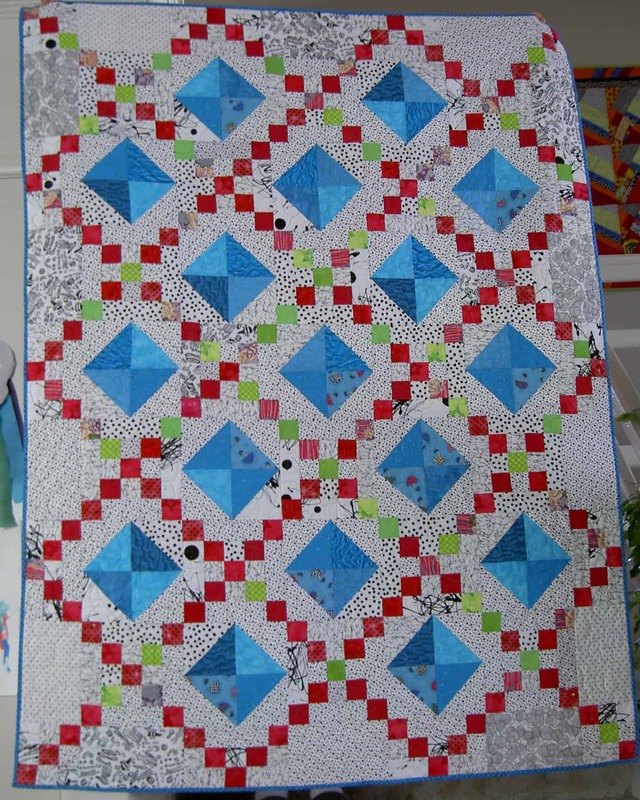 The scale of the different fabrics all vary, but the overall effect works. From close up, the background of En Provence looks somewhat chaotic. The foreground fabrics can handle the chaos, however, because there is no bleeding of color into the background. 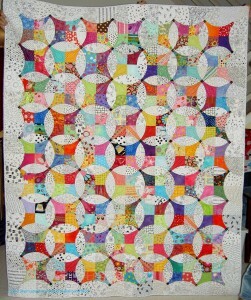 I like the little bit of chaos as it seems to move my eye around the quilt.